Russ is using Smore newsletters to spread the word online. Now that you know that your student will be learning bassoon in the fall, you can begin taking the steps outlined in this flier. 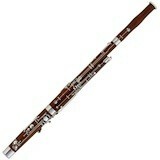 The bassoon is a school-owned instrument. This means that you will rent the instrument from for the school year. The instrument rental fee is $100 for the entire school year (checks must be made out to KMS Band). You will pay this fee at the start of the school year when these instruments are checked out. For now, you just need to obtain all of the necessary supplies listed below.